Druga ashtami is the eight day of the ten days long festival of Dusherra, celebrated throughout India. Ashtami literally means eighth day. This falls in the Ashwin (September- October) month of Hindu calendar. Goddess Durga is considered as a consolidation of eight forms of Shaktis (or powers). Throughout India, Durga is interpreted and worshipped with these different forms in different regions. The eight forms of Ashtanayakis or warrior goddesses are Brahmani, Maheswari, Kaumari, Vaishnavi, Varahi, Narasinghi, Indrani and Chamunda. Although these are different forms, they are still the incarnations of Durga with different purposes. Goddess Chamundi often depicted as dark skinned is shown wearing skulls, bones and serpents in the form of garland. Chamundi’s name is culmination of the names of two demons Chanda and Munda, who were generals of Demon Kings Shumbha-Nishumbha. Chamundi Devi in a fierce battle against Chanda and Munda is said to have slain these demons and earned the name. Sometimes Goddess Chamundi is also identified as Kalika or Parvati. In another legend, Durga devi attaining the form of Vaishno Devi, a little girl is said to have killed Bhairav Nath. Bhairav or Bhairavnath was a Tantrik, who had grown arrogant of his powers. After Bhairavnath was beheaded, he asked for Devi’s forgiveness for his deeds. 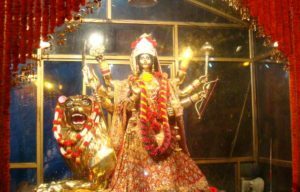 Hence, Devi is said to not only have granted him salvation, but also granted him a boon where every devotee after Vaishno Devi’s darshan is to visit nearby Bhairavnath’s temple to complete their pilgrimage. 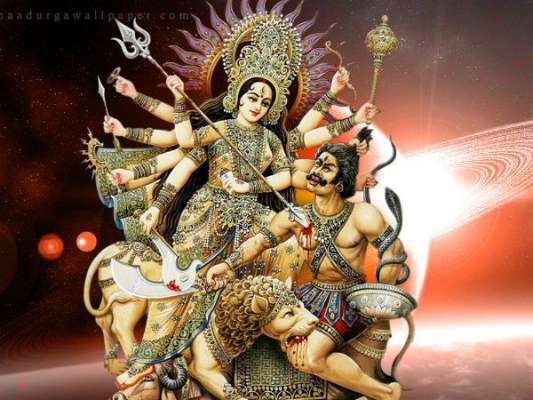 But in the most famous legend, Durga Devi is said to have killed the King of Asuras, Mahishasura. This Buffalo headed demon who had gained gift from Brahma made him immune to Gods and men in general. Hence Durga Devi (Goddess) is said to have rode on lion into the battle, killed him and earned the name Mahishasuramardini. 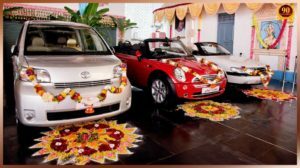 Even Durga Ashtami puja is done differently in different parts of the nation. Devotees after taking bath in the morning, set up Durga Devi’s idol or picture and decorate it with flowers and ornaments. Diyas and incense sticks are lit up. In the form of offerings fruits, sweets, beetle leaves, coconuts and money are placed before the idol. In most parts of India, devotes of Goddess Durga hold a day long fast. 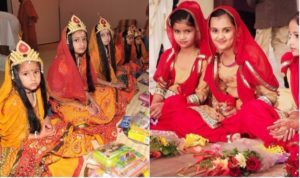 In north India, Kanjaks, group of five to six young and unmarried girls are invited into the home and are honored. According to the tradition, the young girls are welcomed into the home by washing their feet. After the rituals are performed, the little girls are offered food and sweets. The girls are even given some presents before sending them to their respective homes. Astra Puja literally means the worship of instruments. 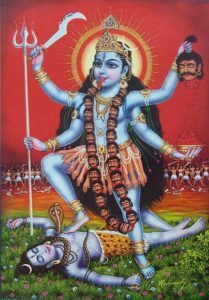 Traditionally during Astra Puja, all the weapons and artilleries used by Devi to kill Mahishasura are cleaned, decorated and worshipped by chanting mantras. In today’s times, people clean their instruments such as TV, pens, computer screen, fridge, books, screw driver, musical instruments, bikes, cars and all kinds of machineries at the factories. Later on they apply vermilion, decorate with flowers and worship them. This signifies the modern day weapons. In south India, this puja takes place on the ninth day of Navratri. In Karnataka, this is known as Ayudh Puja (Ayudh means weapons) while in Maharashtra, Khande Navami. Let’s end the article by chanting a mantra honoring Devi Durga. Namastasyai, namastasyai, namastasyai namo namah!